Discover Oslo on foot with this 3-hour walking tour. As you visit landmarks like the Akershus Castle, the Norwegian Royal Palace, Parliament, and the Opera House, your local guide will share information on Norway from the Vikings through present day. In addition to these major sights your guide will point out lesser known backstreets and other hidden gems. I am so pleased my tour was not cancelled due to me being the only participant. 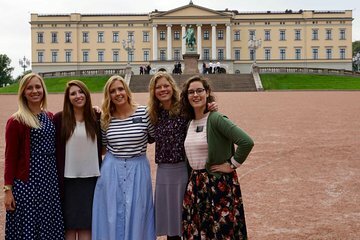 I had just one full day to see as much as posting Oslo. My guide Natalie was fantastic! Highly recommended . She took me through so many different and versatile sections of the city. This tour would definitely please a variety of tastes and expectations. Natalie is very well versed in the history and future of this vibrant city. She is also extremely personable and set the tour to my wish list versus setting the tour by a preconceived checklist of her own. Good on you Natalie! Amazing walking tour! We were new to the city and our guide showed us all the top attractions and knew a lot of fun facts about the city and the country. Highly recommended!